MUFF WIGGLER :: View topic - "The small system"
Here's a bigger pic of the "small system" that I posted to Twitter: a 300 format performance instrument that turned into something rather more similar to a Music Easel than I had at first intended. 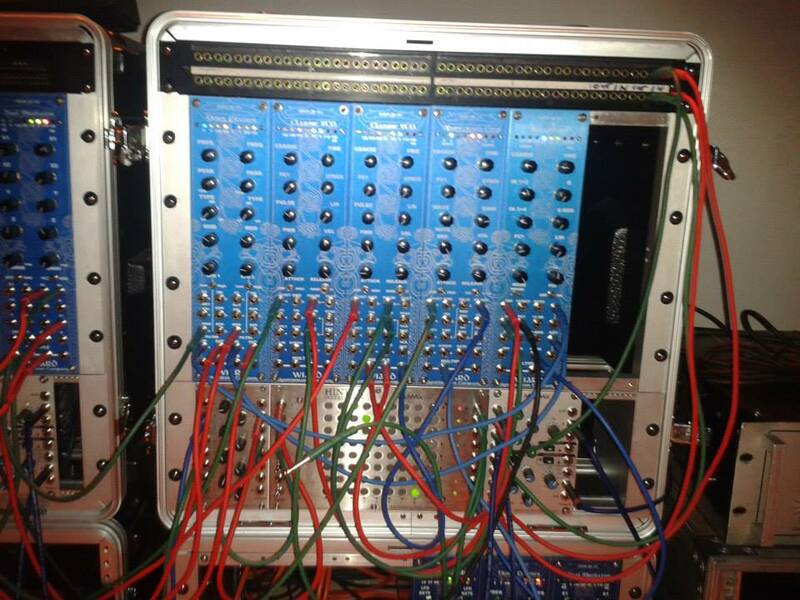 Mostly DIY/Custom modules, as I moved the new Wiard stuff I purchased from contruct09 into the big system. Envelator (I was going to use the quad Topp 281 here, but I needed the extra envelopes in the big system and the crossfader is handy for linking the touchplates). It does the crazed feedback freakout thing like a champ, but with conservative patching it also makes for a very pleasant two voice keybo...er, touchplate synth. Cabinet is another custom thing from Dave at Nice Racks, who continues to deliver just exactly what I need. 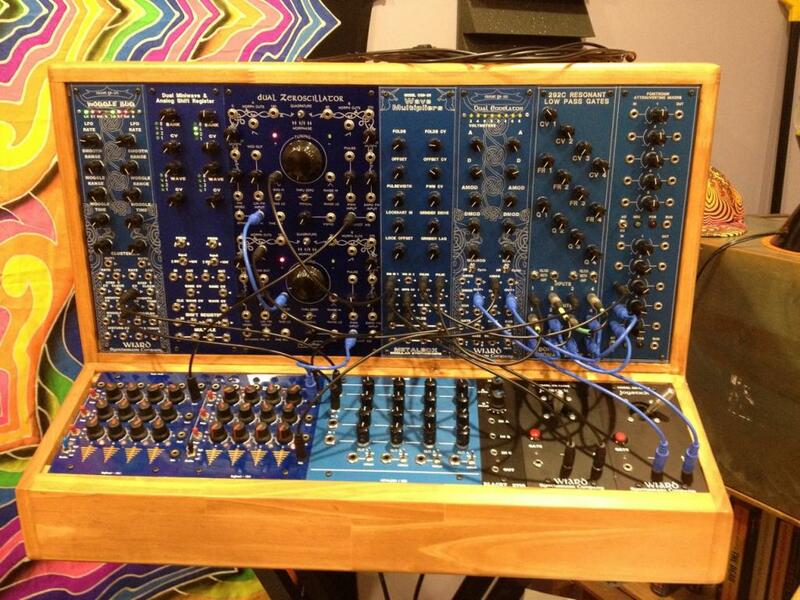 damn thats a sweet group of modules. i love me some frankenfrac so..
also, if you dont mind me asking, how much did that case run you? i know Dave has great prices. here are a few of mine from my last gig. all bantams now. pretty simple on the fly patching. full on neuronal / neurotic patching requires paper, pen + time. left block is CV only... upper right is audio only. 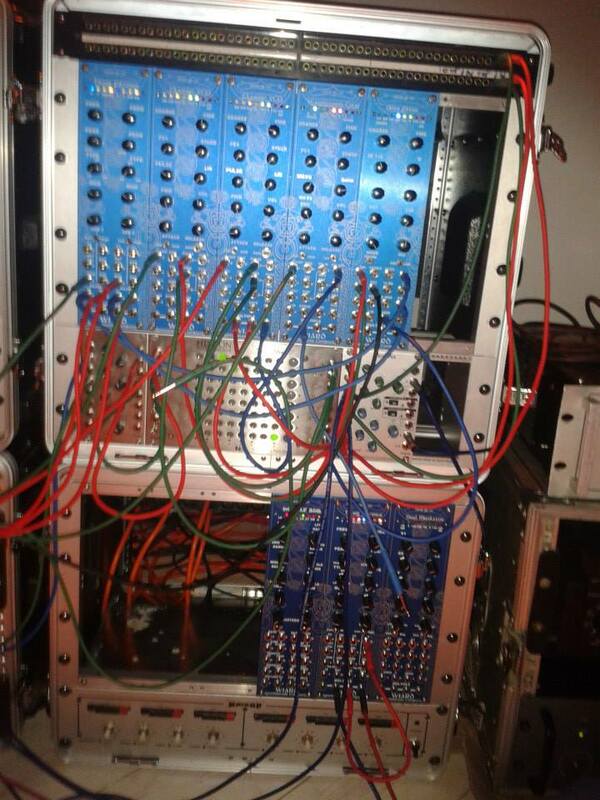 lower right is the miserable drone operators equivalent of "drum machine"
Like the matrix mixer right in the middle there... makes it a real performance control. It is indeed a place of much wonder. The Hinton modules compliment the Wiard perfectly. With the 300 format being limited to 10 knobs and single panel modules only, some functions are sometimes missing, or otherwise tie up a more capable module to do something simple like mixing or attenuation. 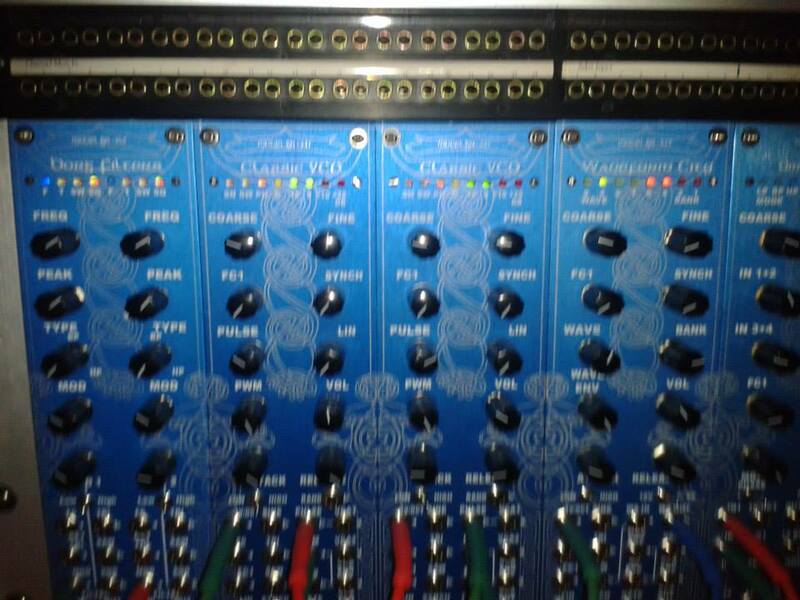 The ModMix and the SwitchMix are the best modules ever designed for these purposes so it's quite a suitable mix. Normally the SwitchMix/Trimmer is totally jammed full of cables putting out very delicately balanced mixes of 4 CV sources and their inversions, but for this gig I didn't have time to prepare and just patched on the fly. Funny you say that, I was just pondering moving the Matrix mixer back to the big system and dropping in a Metalbox Gate Sequencer. 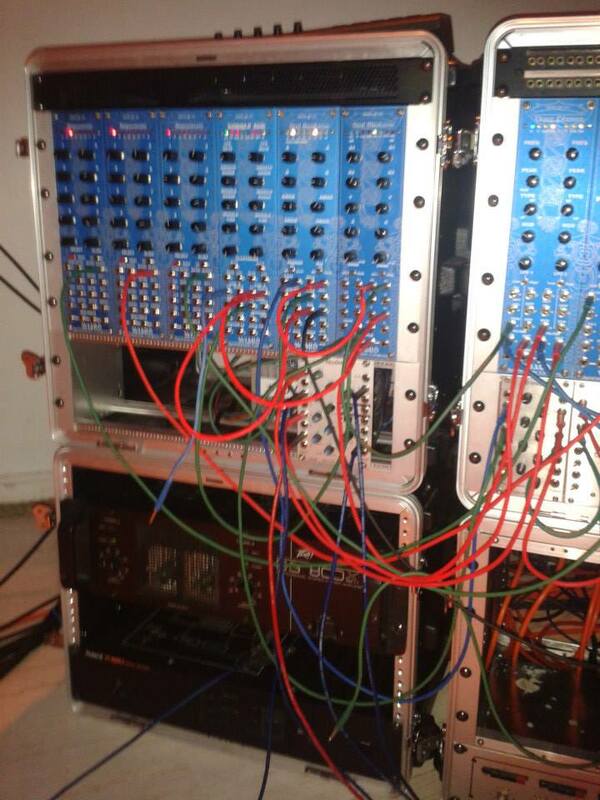 My main problem is that I neglect the Matrix mixer something awful. If it's not at the very heart of the entire patch-- and I rarely start with it, problem #2-- I am often unwilling to unwind what I have to insert it into the middle of things. That's why I put it front and center, to encourage myself to dig into it more often! Matrix mixing really suits the Wiard is all I can say. Really allows a deep level of tonal control, which is one of the aims of the W300... Grant once said to me something like "maximum timbre control from the minimum panel space", and a Matrix mixer taps into that and expands it.